This weekend our little portion of the North Canadian River was rolling too hard for our particular brand of kayaking. However, with Dianne's kayak newly repaired, we were eager to get on the water somewhere. I've heard the traffic on the Illinois River is unseasonably slow, but Momma wanted to stay close to home. 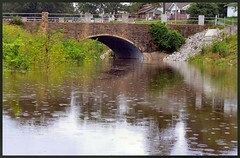 Luckily for us, Okmulgee Creek (Greasy Creek) is flooded. This provided us with the opportunity to paddle both Greasy Creek and the exercise trail at Okmulgee Municipal Park (near the YMCA on 20th Street). Paddling the Okmulgee Creek is actually quite nice once you get past the odor and the cars honking as they pass. Dianne's Mom even stopped by to take my Perception Swifty kayak out for a quick paddle around the soccer goals. Paddling Greasy Creek reminded me of one of the key benefits of having a Sit-Inside-Kayak as opposed to a Sit-On-Top kayak. Sometimes, you don't want the water to touch you at all. Flood water is likely to be contaminated, so swimming in it is never advised. Sit-on-Top kayaks tend to get more water on you than one might prefer during the winter or while paddling in nasty water.